Known as Argentine Islands until 15 Aug 1977. 7 Jan 1947 – 6 Feb 1996. It was occupied continuously for a total of 49 years and 31 days by FIDS and BAS, the longest continuous occupation of any British station to date. The first hut was built on Winter Island, the site of the British Graham Land Expedition (BGLE) hut of 1935-36 which had been destroyed (possibly by a tsunami) in 1946. 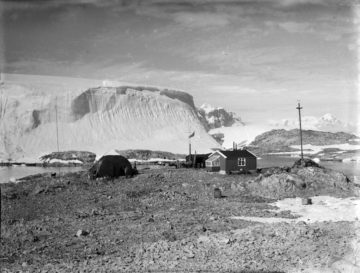 It was named Wordie House after Sir James Wordie, member of Shackleton’s Imperial Trans-Antarctic Expedition 1914-16, Operation Tabarin Advisory Committee 1943-45 and FID Scientific Committee 1948. 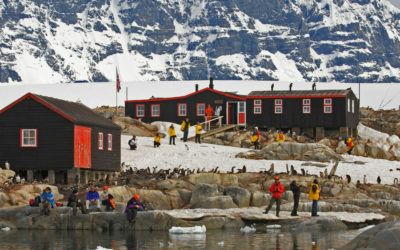 It was closed on 30 May 1954 when the station was transferred to Galindez Island, but was re-occupied in the winter of 1960 when personnel for Adelaide (Station T) failed to reach Adelaide Island and had to winter there. New buildings were erected on Galindez Island in Feb 1954. The main building was named Coronation House after the coronation of Queen Elizabeth II in 1953. 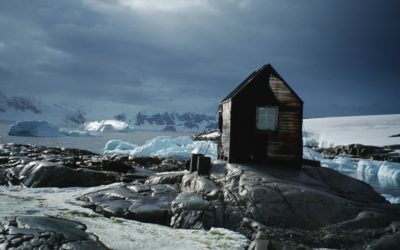 Field huts: An Argentine refuge hut on Petermann Island was used periodically by BAS personnel from Faraday Station. G H Hargreaves, M A Walker and G J Whitfield, Sep 1976: single cross on Rasmussen Island. A C Morgan, K P Ockleton and J Coll, 14 Aug 1982: single cross on Petermann Island. Wordie House was designated as Historic Site No. 62 under the Antarctic Treaty, 19 May 1995. The Galindez Island station complex was transferred to the Ukraine on 6 Feb 1996 and renamed Vernadsky. Personnel from Vernadsky keep a watching brief on Wordie House. A conservation architect inspected Wordie House for BAS in Jan 2007. It has been managed by UKAHT since Oct 2009 under a Memorandum of Understanding with BAS.